Swansea City chairman Huw Jenkins says the club's proposed takeover by an American consortium may not be completed until next season. US businessmen Jason Levien and Steve Kaplan are leading a bid to buy a 60% stake in Wales' only Premier League club. Swansea had hoped the deal would be done by the end of 2015-16. "It remains to be seen if it will be done before the start of next season," Jenkins told BBC Wales Sport. "Will it be taken further and finalised in the summer? We wait to see. "All we can do is try to continue along the same path and get ready for next season." 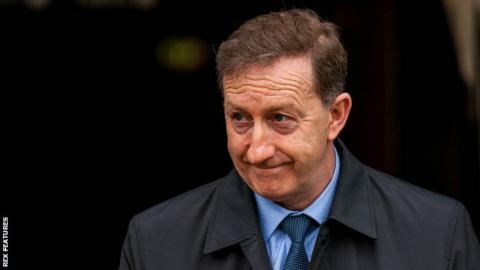 Jenkins is among the shareholders set to enjoy a tenfold windfall on the shares they purchased during a successful rescue of what was an ailing club in 2002. Francesco Guidolin will remain manager for the next two seasons after signing a fresh deal. Asked whether the potential new owners had any input into the decision to retain Guidolin, Jenkins said: "They are fully aware of the way we run the club and try to do things in a certain way. "They are fully aware of how we work and why we make the decisions that we do." Jenkins also revealed Swansea held talks with former boss Brendan Rodgers before opting to stick with Italian Guidolin.